South of France yacht rental? Sardinia yacht charter? Renting a boat in Corsica, chartering a yacht in the Balearics, in Croatia or in Greece? It is fair to say that nature has spoilt these territories quite well. We have selected for you the most beautiful Mediterranean beaches to discover during your next yacht charter. Let us guide you! During your south of France yacht rental, you won't want to miss anchoring in the bay of Pampelonne, just off Saint-Tropez. The superb bay extends for nearly 4.5 km. 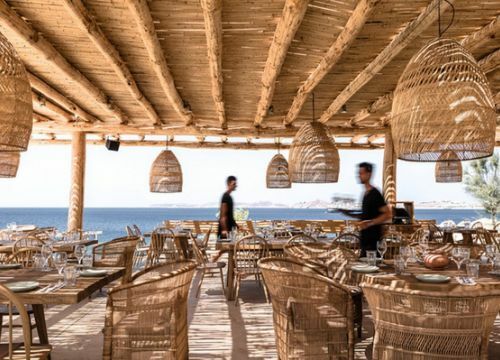 The beach, covered with white sand, has some of the most exclusive beach restaurants in the south of France. Surely your yacht will not be the only one at anchor but this mythical beach of the French Riviera is worth a visit for its enchanting environment between the azure blue of the sea and the contrasting green of the pine forests. For more tranquillity, we recommend that you sail a little further to the Escalet beach. The water there is very clear and it is ideal for water activities such as snorkeling or paddling. La Mala beach is a renowned in the south of France for its enchanting setting and the quality of its waters. This small corner of paradise is nestled between cliffs and bordered by lush Mediterranean vegetation. Like most of the secluded beaches on the French Riviera, it is covered with pebbles. The anchorage is very popular with yacht charterers who can also enjoy a delicious lunch at the eponymous beach restaurant. Pointe de l'Aiguille beach in Théoule-sur-Mer is a disorienting paradise. It is located below the scenic Corniche d'Or road, which links the cities of Saint-Raphaël and Cannes. The beach, actually made up of many small wild coves, is nestled in the magnificent red rocks of the Massif de l'Estérel. The spot offers superb panoramic views of the Lérins islands, the bay of Cannes and the mountains in the background. Feel free to use your masks, flippers and snorkel to explore the underwater world! Let's start with our favorite beach in Corsica. Located in a bay, halfway between Bonifacio and Porto Vecchio, Rondinara has several times been voted the most beautiful beach in France. It is characterized by its almost perfect round shape and offers a protected body of water. The beach is particularly famous for the finesse of its sand and the clarity of its waters. Rondinara is a real haven of peace for those who wish to spend time at anchor when chartering a yacht in Corsica. This Corsican mythical beach keeps on seducing with its transparent waters, pines, white sand and rock formations. Palombaggia competes uncompromisingly with the most beautiful beaches of the Caribbean. During your yacht rental in Corsica, be sure to drop anchor near Palombaggia... You'll discover its enchanting setting, swim and indulge in the water sports offered by your yacht. Located in a remote part of northern Corsica, Saleccia is another of our favourite Corsican beaches. The beach is right at the entrance of Désert des Agriates and access by land is most difficult – it takes several hours through a rugged desertic terrain. Luckily the boat access is great and you can enjoy a dreamy scenery without the effort! 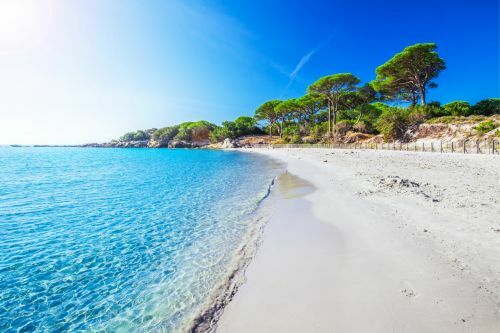 With its fragrant Corsican maquis, kilometres of white sand and the turquoise waters lapping gently the hull of your charter yacht, Saleccia is definitely one of the most beautiful beaches you’ve ever seen. 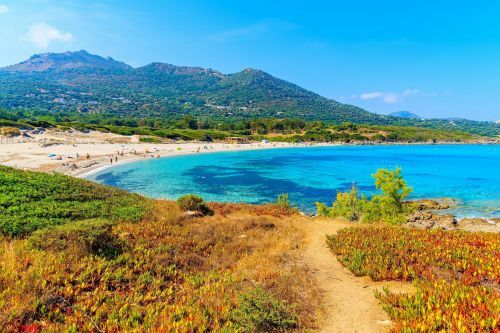 Known as the Aga Khan’s favourite beach, Spiaggia Del Principe (the beach of the Prince) is a must-stop if you’re chartering a yacht on the Costa Semeralda in Sardinia. This pristine beach has beautiful crystal-clear waters and an unspoilt stretch of white sand. Surrounded by jagged rocks, the beach has a striking horseshoe shape. 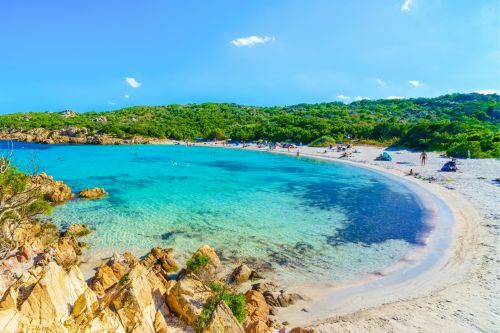 Sardinia is famous for its magnificent beaches and no doubt you will explore some of them during your yacht charter in Sardinia but Spiaggia Del Principe really stands out. If you’re planning to cruise to La Maddalena Archipelago while renting a yacht in Sardinia, don’t miss a trip to Cala Soraja located on the beautiful island of Spargi. 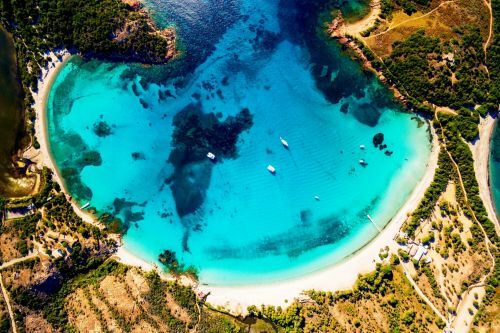 Only reachable by yacht, this tiny beach is a hidden gem. We recommend you visit early in the morning or at sunset, to avoid the tourist boat tours. With its incredible turquoise waters and white sand, Cala Soraja is one of the greatest attractions in the protected natural park of La Maddalena. 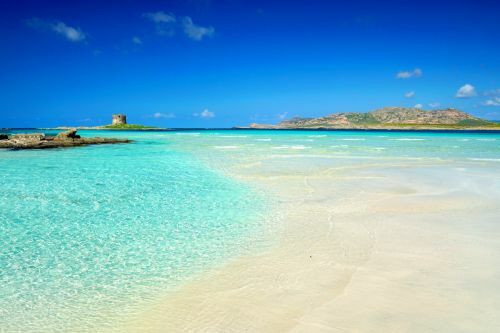 Located at the northern tip of Sardinia, La Pelosa beach is a real paradise. Its waters compare to those of tropical seas. Snorkeling enthusiasts will be able to enjoy underwater exploration. From the deck of your charter yacht, you can enjoy stunning views over the islands of Piana and Asinara, as well as an ancient Aragonese tower that dominates this enchanting landscape. 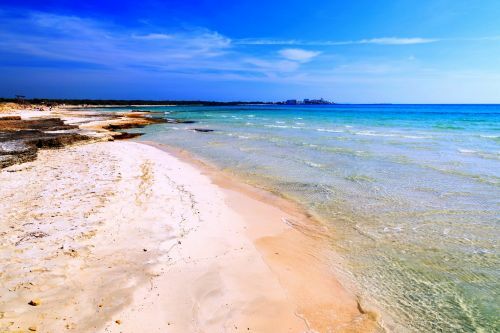 Es Trenc is a large white sandy beach located south of Mallorca. 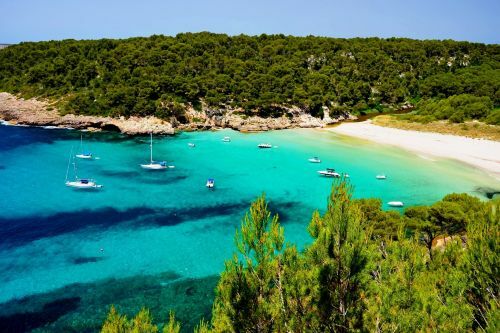 It is one of the most beautiful beaches on the island and a place not to be missed during a Balearics yacht rental! Near the beach are the Salinas d'Es Trenc where the salt flower is harvested. The site is magnificent and remains protected from any urban development. Access by land is not easy and this limits the number of tourists on the 2 miles of white sand. 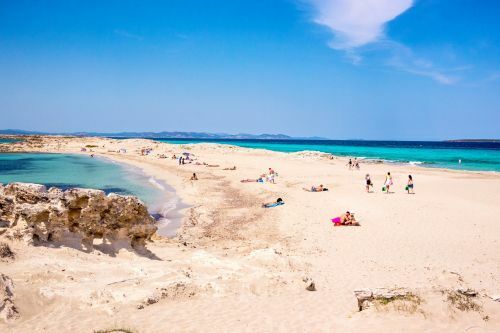 Our favourite beach on Formentera, the smallest island in the Balearics. Nestled in the Salines Natural Park, surrounded by large sand dunes, Ses Illetes offers the perfect beach setting. 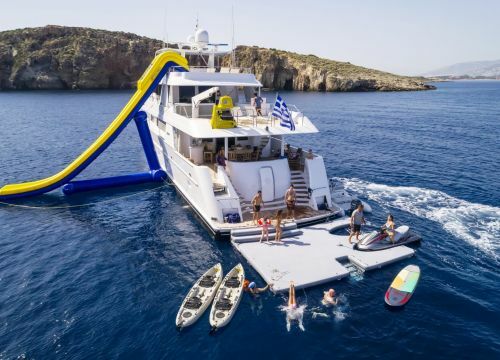 Yacht charterers love the spot and you will rapidly notice your charter yacht is not the only one to be anchored off this paradise. In the summer, its Polynesian lagoon feel attracts many tourists. The beach is relatively long so your Captain can find a quiet anchorage point. If Cala Mitjana remains for many the most beautiful beach in Menorca, it is now so populated by tourists that it has lost all its charm. Despite being a total paradise, Cala Trebaluger beach is not so popular because of its difficult access by land. That said, it is ideal to explore during a Balearics yacht charter. The sandy beach is superb and the waters are crystal clear - perfect for snorkelling or to try out the water activities of your charter yacht. 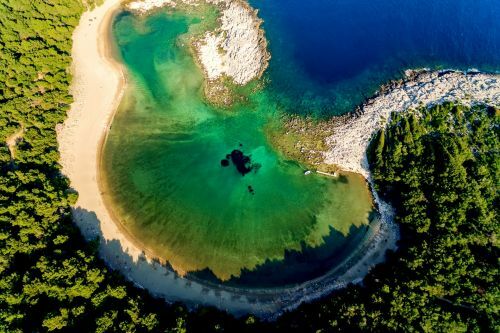 Your yacht charter in Croatia will certainly take you to the beautiful island of Brac which has one of the most beautiful beaches in Croatia and certainly the most photographed. 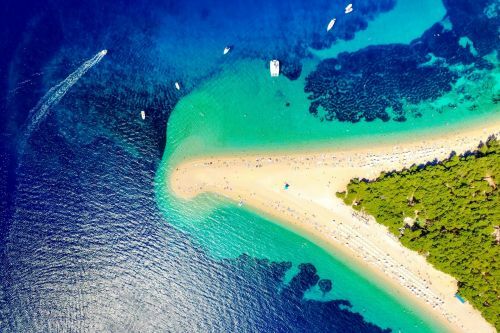 The name of the beach “Zlatni Rat” translates into “golden horn”. This gorgeous strip of land, covered with white pebbles, extends to the sea, offering a unique landscape. The shape of the beach changes according to the sea currents. It is the ideal place for water sports enthusiasts. Tucked away in the Zadar archipelago, Saharun beach is easy to miss but make sure you drop anchor if you charter a yacht in Croatia. The crystalline waters are ideal for swimming and snorkeling. You will enjoy swimming towards the shore as the water is shallow. In the background, a superb pine forest completes the postcard landscape. The Mljet archipelago is one of the most beautiful gems in Croatia. It is in the very heart of the archipelago that you will discover the beach of Saplunara. It stretches for only one kilometre and is surrounded by a massive pine forest, which makes it very wild! Off the beaten track and therefore not very touristy, Saplunara beach is ideal for having a good relaxing time. Sporty yacht guests can go canoeing, snorkeling or even visiting the surroundings by bike. Hidden on the island of Zakynthos, Navagio is one of the most unique beaches in the Mediterranean to discover during a Greece yacht rental. 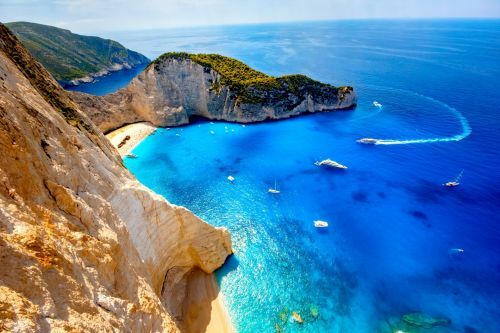 With its cove surrounded by white limestone cliffs, Navagio beach seems cut off from the rest of the world. A shipwreck (hence the name of the beach) slowly rusts on the sand, making the landscape all the more spectacular. It is accessible only by boat but you won’t be alone as tourist boat tours come and go throughout the day. 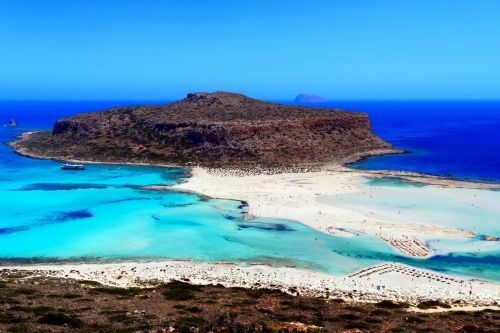 If you're chartering a yacht in Crete, you need to anchor off Balos aka the postcard beach for an afternoon of relaxation. Shades of white and red, pure sand and a blue lagoon with heavenly waters. The water in the lagoon is warm and it's really nice to swim there. The islet of Gramvoussa with its Venetian castle makes the landscape even more spectacular. In summer, there are a lot of people but as the spot is huge, you don't get the mass tourism feeling. 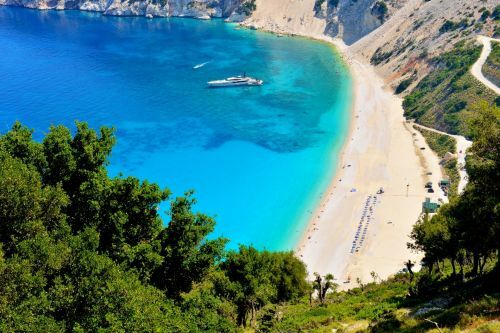 Myrtos beach is located on the island of Kefalonia. It is surrounded by 2 steep mountains that reach an altitude of 900m. This long beach of white pebbles borders a turquoise sea that has nothing to envy to the Caribbean. Water sports are not allowed, so it is the ideal place for a peaceful swim and sunbathing. The waters are crystal clear and you may be able to spot some turtles. However, mooring can be difficult due to depths and wind. In the evening, the sunset is simply magnificent – this could well be the highlight of your yacht rental in Greece. If you feel the desire to swim azure waters and walk on the fine sand of a wild, paradisiacal or secret beach, contact our team today to arrange your next yacht charter in the Mediterranean.